Historically speaking, lithophanes are images made in porcelain with an etching or moulding process, in which an image is visible when backlit due to the varying thickness of the material. Porcelain isn’t the easiest thing to work with, but thankfully for those of us in the present, 3D printers are here to make everything better. [RCLifeOn] has been experimenting with printing lithophanes with great results. The trick to printing a good lithophane is all in the preparation. It’s important to pick an image that looks good in greyscale, as this is not a process that reproduces color in any way. [RCLifeOn] then discusses the finer points of printer setup to get a nice looking print. Layer heights should be as small as possible to avoid visible vertical bands, and the lithophane should be printed in a vertical orientation, to avoid the print sagging due to a lack of support. Infill is best set to 100%. Most importantly, the printer should avoid crossing the outline of the print to avoid any stringy plastic artifacts spoiling the final product. It’s a great guide that should help even a 3D printing novice create a great print with the minimum of fuss. A lithophane can make a wonderful gift and is also a good test of a printer’s capabilities, due to the fine detail required. We’ve seen them produced before too, in a wonderful lightbox configuration. Video after the break. While we often think we are clever designers, living things often meet or beat the best human designs. It is easy to forget that nature even has living lightbulbs, among them the firefly. Researchers from Penn State decided to compare how fireflies create light and found that they deal with a problem similar to LEDs. The insight may lead to an increase in efficiency for LEDs, which is currently about 50%. The problem is that some light generated never gets out of the LED (or the firefly’s body). Some light inevitably reflects back into the device. One known mitigation for this is creating a tiny texture pattern on the LED surface which allows more light to escape. These are typically a V-shaped structure etched into the surface. This isn’t news to the firefly, however, which has similar structures on their lanterns as do some other light-generating animals (apparently glowing cockroaches are a thing). However, the organic structures differ from LED textures in an important way. Google has promised us new hardware products for machine learning at the edge, and now it’s finally out. The thing you’re going to take away from this is that Google built a Raspberry Pi with machine learning. This is Google’s Coral, with an Edge TPU platform, a custom-made ASIC that is designed to run machine learning algorithms ‘at the edge’. Here is the link to the board that looks like a Raspberry Pi. This new hardware was launched ahead of the TensorFlow Dev Summit, revolving around machine learning and ‘AI’ in embedded applications, specifically power- and computationally-limited environments. This is ‘the edge’ in marketing speak, and already we’ve seen a few products designed from the ground up to run ML algorithms and inference in embedded applications. There are RISC-V microcontrollers with machine learning accelerators available now, and Nvidia has been working on this for years. Now Google is throwing their hat into the ring with a custom-designed ASIC that accelerates TensorFlow. It just so happens that the board looks like a Raspberry Pi. Water is a stable chemical, but with the addition of a little electricity, it can be split into its component parts. The result is just the right mix of H2 and O2 to convert back into water with a bang. [Peter Sripol] has built a charming desktop cannon in just such a way. The build consists of a contact lens canister filled with a solution of water and potassium hydroxide. By running a DC current through this solution, oxyhydrogen is produced, which then passes through a flash arrestor and into a combustion chamber. Upon the chamber is affixed a rocket, which is propelled when the charge is lit by a piezoelectric ignitor. The chemical side of the build was easy, but it took significant experimentation to get the rocket side of things working well. Eventually success was found by creating a blast cap out of paper and hot glue which allowed the energy of the blast to be more effectively transferred to the rocket body. With this in place, the cannon is capable of firing small paper rockets in excess of 20 feet. With the brass and copper components mounted upon stained wood, this contraption would look beautiful on any desk and would be great for assailing one’s fellow coworkers. If your office doesn’t have an explosives policy yet, once you bring this in to work, it will soon. [Peter] uses similar technology in his Nerf blasters, too. Video after the break. For the odd job every now and then, a regular screwdriver does the job. However, in situations like a small production operation, it can quickly become uncomfortable to use. In these situations, an electric screwdriver is incredibly useful. 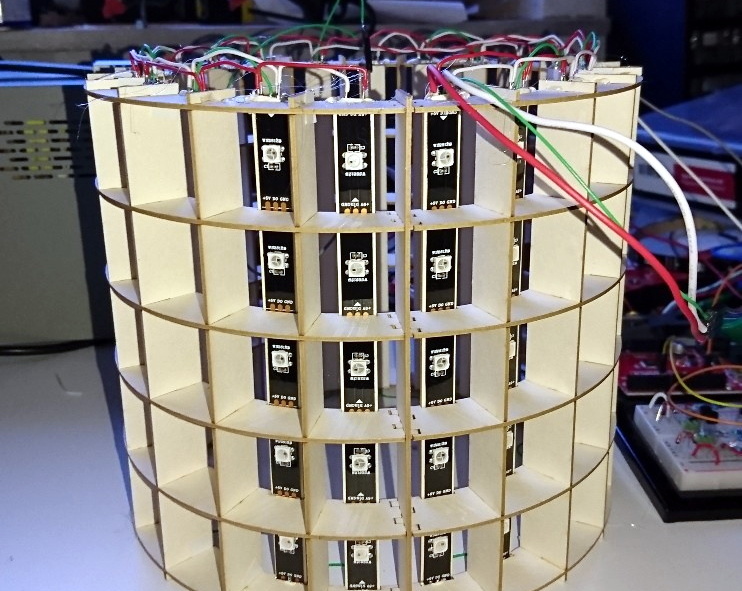 There’s no need to rush out to the store, however – you can build one yourself, and [Electronoobs] did just that. The build is simple, consisting of a series of cheap modules hooked up together. An 18650 battery provides power through a boost converter to an H-bridge motor controller, which allows the DC geared motor to be driven both forwards and backwards. There’s also a USB battery charge module, that allows the screwdriver to be recharged from a standard micro USB charger. It’s all neatly packaged in a 3D printed case with a couple of tactile buttons for forward and reverse operation. It’s a testament to the quality of modern supply chains that one can assemble a usable tool like this at home from prepackaged modules. All the parts, including the bearing and drill chuck, were sourced from eBay. We’ve seen servos repurposed into electric screwdrivers, too. Video after the break.